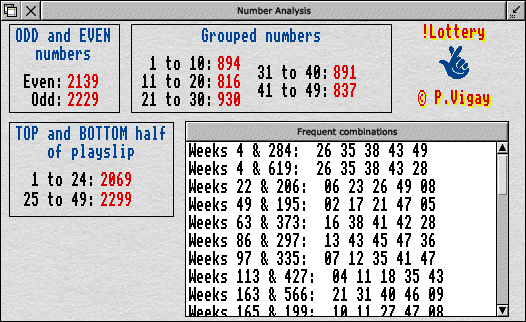 Lottery is possibly the most feature packed Lottery number guessing and analysing application available for RISC OS machines. The list of features includes, frequency charts, scatter graphs, block guesses, a full range of statistics, the ability to print out predictions onto the official payslips using standard Acorn printer drivers, automatic win checking, plus much more. The main archive contains all UK draw results up to Sat, 1st November 2008 but you can download the latest set of results from the links below. I used to use this application to run a lottery syndicate at work, buying 50 lines of tickets each week, using numbers calculated by !Lottery. During a two year period I analysed the predicted results compared with our actual winnings. I discovered to my surprise that !Lottery had doubled our changes of winning, or in other words had halved the odds of winning a prize. The odds of winning at least a £10 prize are approximately 54 to 1. !Lottery's predictions were consistently winning at odds of approximately 22 to 1 - so although we didn't win any major prizes, hopefully the odds of doing so are reduced somewhat. You can download the latest set of results from the National Lottery website at www.national-lottery.co.uk/player/p/results/resultsHistory/resultsHistoryDownload.do which you can simply drag into !Lottery's main window in order to import. 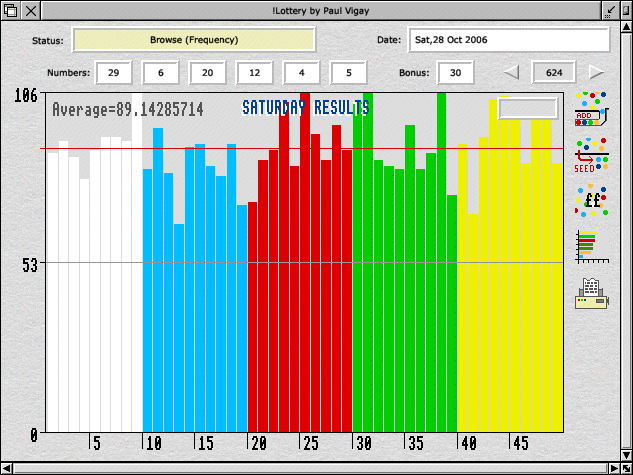 You can also download a copy from my server, containing all results up to and including Sat 1st November 2008. To update, simply extract from the archive and drop over the top of your existing !Lottery application. b) Amended window template for block guess window, to make icons wider. could inadvertently be pressed whilst using another application). count as more than a single win. c) Added additional 'online' buttons to 'Info' window. d) Removed software protection checking of Templates file. b) Added import utility, to allow importing of results data in CSV format. b) Amended block guess to display the best set of numbers so far. a) Re-compiled using 32-bit compiler. c) Prevented loading multiple copies of !Lottery. lock up the print playslip reoutine. c) Added no. of days left to 'unregistered' Info window. official documentation! Thanks to John Davidson for pointing this out. For previous versions, see the 'History' file inside the actual application.